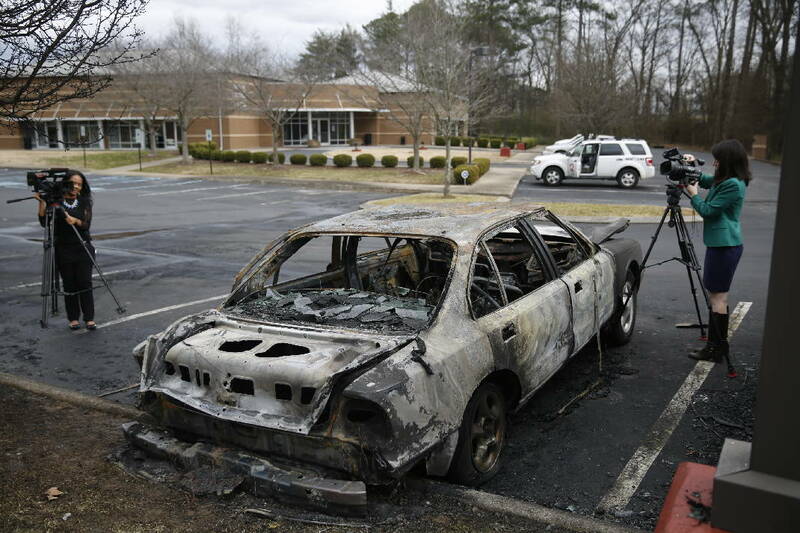 Members of the media videotape a burned car at the Jewish Cultural Center in Chattanooga on Sunday. The Jewish Cultural Center on North Terrace, where two burned vehicles were discovered, is seen on Sunday, Jan. 31, 2016, in Chattanooga, Tenn. The Chattanooga Police department said that officers responding to a call of damaged property at the center discovered two burned vehicles, and the incident is being investigated as arson. Chattanooga police increased patrols near local Jewish centers and places of worship Sunday after damaged vehicles were found at the Jewish Cultural Center in the morning. Two cars in the parking lot were burned, one more severely than the other. Another vehicle was parked next to them but did not appear to have serious damage. Police and leaders in the local Jewish community did not publicly jump to conclusions about the incident, but police said in a news release they were trying to determine if prejudice was behind the blaze. The executive director of the Jewish Federation of Greater Chattanooga, Michael Dzik, said in a statement his organization was letting authorities investigate before commenting on the circumstances of the incident. "I am confident and trust they will complete a thorough investigation and hopefully bring the perpetrators to justice," Dzik wrote. "At this time the initial report seems to be a random act, not a hate crime." The charred and blackened vehicles remained on the outskirts of the center's parking lot at 5461 North Terrace Road on Sunday afternoon and a police officer kept watch. A team of arson investigators from the Chattanooga Fire Department aided in the investigation, but CPD led the investigation "due to the potential violent nature of this crime," according to the police news release. Police also notified the Federal Bureau of Investigation and the District Attorney's Office. Dzik's statement said the Jewish Cultural Center is a partner agency of the United Way of Greater Chattanooga and the damaged vehicles were used to take senior citizens on errands and for delivering meals to home-bound community members. "We are thankful of the quick response by the Chattanooga first responders," Dzik wrote. "Additionally, we are thankful that no one was hurt or injured by this incident."